By healing the oceans, we help our children. When the ocean is thriving with life, so do we! The creative power of water gives us life. 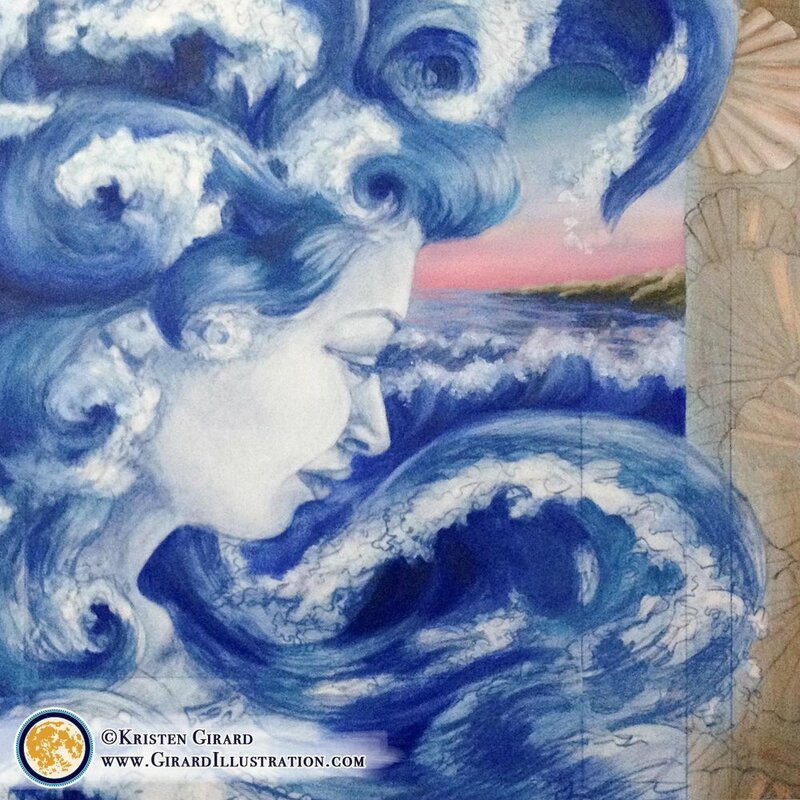 This is a work in progress photo of illustration Water Magic by Kristen Girard. Gorgeous limited edition canvas prints are currently available in the Art and Stories Shop. 10% of the net profits from every purchase of this lovely goddess art print go directly to funding biodiversity conservation and habitat restoration efforts. © Kristen Girard at Girard Illustration. Water is a precious resource, yet everyday it gets a little dirtier, a little more toxic, and a lot less able to support either salt water or fresh water aquatic life or people on land. When I say dirty, dirt – as in soil, plant debris, pebbles, or even mud is not the problem. What I mean by toxic and dirty is human and big farm waste runoff into small streams, that feed big rivers, that all go down to the ocean. Soil, plant debris, and the pebble kind of dirt is actually very good for creatures in water habitats periodically because with all this natural dirt comes essential nutrients and food sources that fuel the web of life. Human and big farm waste runoff, on the other hand, is horrible for aquatic life because it carries way too much ammonia (many household cleaners contain ammonia - which is great for cleaning houses because it can disinfect surfaces). In the large quantities that come from human and animal waste runoff (literally urine and poo) chokes the life out of fish, frogs, shrimp, and even lobsters because they are trying to live in a toxic soup. Imagine trying to swim all day in an ammonia bath. What would that do to your eyes? Your skin? It's stomache churning thinking about it, isn't it? And then people fish for, and eat, the ones that manage to survive. Which means that people are eating up all the toxins that the lobster, fish, and shrimp absorbed during their short life times. Which is making people sick... It's a vicious circle. And with each cyle - more pollution causes aquatic life to keep dying, and not many are able to have healthy young. And then the sealife that does make it becomes seafood. This means that aquatic poplulations are constantly being depleted from the double whammy of loses due to yucky water they are struggling to survive in AND excess harvesting by humans. All this adds up to there being no fish. No lobster. No shrimp. All gone because of avoidable pollution and overfishing. You and I, on our own and together, can change this. We can clean up water, help wildlife, and keep ourselves healthy. But we have to take action. With each purchase you make of artwork, decor, and stories here at Girard Illustration, you are helping to fund efforts to preserve, sustainably protect, and restore biodiversity. Our mission is to take action today that helps people, animals and plants thrive together on our beautiful planet earth for generation after generation. Keep up to date on how you can help keep the world a vibrant planet full of wonderous life. Sign up for art letters.